Bristol City grabbed a late goal to seal a 2-1 win over Everton Ladies in a sun-soaked afternoon at the Marine Travel Arena in Crosby. First-half goals from Danielle Turner and Lauren Hemp sent the sides in level at the break, but an 89th-minute free-kick from Julie Biesmans secured a vital win for the away side. The result sees the Vixens swap places with the Toffees in the WSL 1 table, with Bristol moving up to eighth and Everton dropping to ninth. The hosts took an early lead, as Turner latched on to a long ball forward from Angharad James, to calmly slot past Sophie Baggaley on seven minutes. Bristol City struck back ten minutes later, as some neat interplay in midfield found Hemp in space on the edge of the Everton penalty area, and she blasted home into the bottom corner. The visitors had the better chances in the remainder of the first half, with Biesmans firing an effort just over the bar on 22 minutes, and Hemp sent a curling shot just off target five minutes later. Everton started the second half brightly, and Courtney Sweetman-Kirk almost put them in front, but her effort from a tight angle just missed the far post, on 48 minutes. She was denied a again on 69 minutes, as an excellent late intervention from Mille Turner prevented her from making contact with a whipped left wing cross. The home side increased the pressure in the closing stages, with Megan Finnigan’s header saved by Baggaley on 76 minutes, but there was little they could do about Biesmans' spectacular late free kick. Belgian international Biesmans sealed a dramatic late victory for the away team. Her curling 25-yard effort from the right evaded everyone and flew into the top corner. Bristol City manager Willie Kirk said: "To be honest, with a few minutes to go, I was standing in the side of the pitch thinking we just need one chance. I didn't expect it to come from a wide free kick, but the work up to it came from our young sub Lily Woodham. She was only on for five minutes, but she played a big part. "The girls have had a tough week: we took a sore result against Man City, we were down to 14 players ahead of today and we got a player injured in the warm-up. We've been up against it, but we responded with a lot of heart and endeavour. "The girls showed a lot of maturity in the back line today, it was a very well organised second half performance. Everyone played their part and we had to stay strong in the second half." 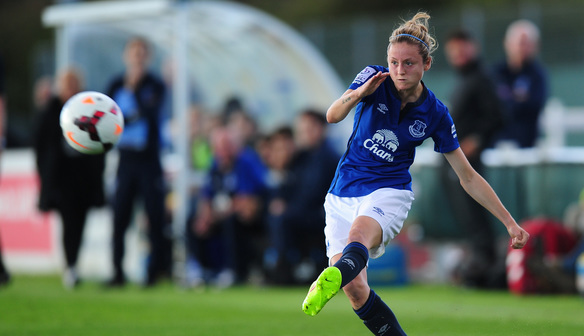 Everton's Chloe Kelly said: "We are really disappointed not to get a draw out of the game. I think we lacked concentration towards the end. "On the whole we need to work on being more switched on in the closing minutes. "We started the game and we need to control things when we do take the lead, and I think we lacked that today. When we take the lead we need to stay tight defensively, as today we lost what we had done well." Both teams face Yeovil Town as their next opponents, with Everton hosting on Wednesday and Bristol visiting on Saturday. Kirk said: "The result is a bossy one that we take forward to the remaining games of the season." Kelly added: "We go again on Wednesday night, it will be a big game and we need to get out ideas together. "But we go away now and prepare for Wednesday's game and look forward."